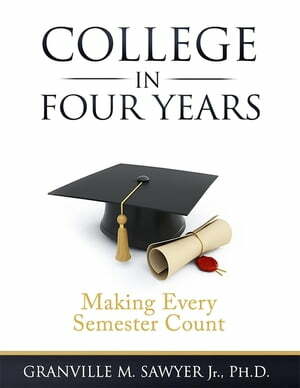 Collins Booksellers - College in Four Years by Granville M. Sawyer, 9780991614318. Buy this book online. College Success is more than getting into a college or university. Success means leaving—in four years—with a college degree. College in Four Years is the essential guide to graduating in just four years with better grades and less stress while keeping tuition costs low. At colleges and universities, large and small, Professor Sawyer has coached, counseled and cajoled students to success—helping more than 10,000 students earn college degrees. After years of giving advice verbally, students, and some of their parents said, “Doc, you need to write this stuff down!” The result is, College in Four Years: Making Every Semester Count. This practical, easy to use guide takes students from freshman dreams to graduation reality—and then on to success in work and in life. Through real stories about real college students, and some of his own experiences, Professor Sawyer empowers students from all backgrounds and in all disciplines of study to achieve college success. Students get unique tools, insights and insider opportunities that Dr. Sawyer developed over three decades in higher education; tools that motivate and empower students to take control of their destiny making every class, every grade and every semester count. I needed this book when I was in college! "College in Four Years" was very useful and really helped me through my first semester. It made a big difference in my grades and my GPA!"